YouTube has infuriated its own content creators over cementing its "advertiser-friendly" policies. YouTube influencers are criticizing the Google-owned platform for censoring content, potentially putting them out of work. On Wednesday, YouTube influencer Philip DeFranco, known for his news analysis show, posted a video to YouTube claiming that the platform flagged 12 of his videos for not being "advertiser-friendly" because of "excessive strong language." 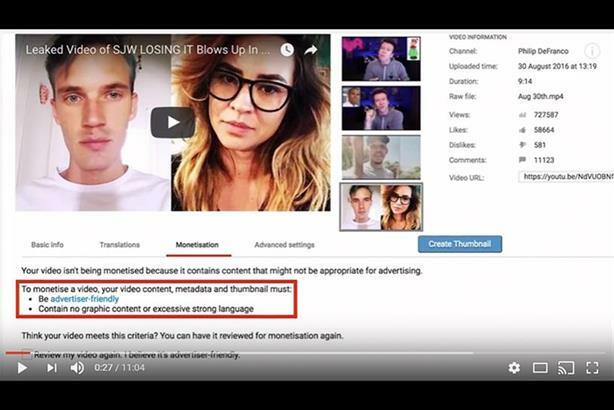 Essentially, this demonetizes his content, disabling advertisers from placing ads before his videos. In the video, DeFranco, who has over 4.5 million subscribers, argues that his content was not offensive and that YouTube’s process is a form of censorship. "Taking away the ability to monetize a video where you’re saying things that they don’t deem "okay," that’s been described as censorship with a different name," says DeFrano, "because if you do this on the regular, and have no advertising, it’s not sustainable." His video, which now has more than 1.5 million views, is also trending on the very platform he is criticizing. And he’s not the only one that feels that way. On Twitter the hashtag #YouTubeisOverParty was trending, with more than 100,000 tweets by time of publication. YouTube’s "Advertiser-friendly content guidelines" states that videos that include sexually suggestive content, violence, inappropriate language, promotion of drugs and "controversial or sensitive subjects and events" may not be approved for monetization. "YouTube reserves the right to not monetize a video, as well as suspend monetization features on channels that repeatedly submit videos violating our policies," the post says. According to YouTube, the policy has not changed. However, the platform is rolling out modifications to their notification process. "While our policy of demonetizing videos due to advertiser-friendly concerns hasn’t changed, we’ve recently improved the notification and appeal process to ensure better communication to our creators," said a spokesman for YouTube. There are three main changes to this process, according to YouTube. First of all, if a video does not qualify as "advertiser-friendly" a yellow money icon ($) will show up in a user’s video manager. Before, the information could only be found at the video-level analytics. Next, creators will be notified by email if their content becomes demonetized. Finally, YouTube is trying to make the appeal process simpler by allowing creators to click on the money icon. But the reaction from social influencers and the rest of the public shows that it’s likely these policies were not being implemented to this extent before. In the video, LukeisNotSexy says content he posted about depression was flagged. "While the majority of these guidelines are good things that try to block out negative content," says LukeisNotSexy, "somehow YouTube has also blacklisted genuinely helpful videos such as mental health videos and Phillip DeFranco’s news analysis show." Other YouTubers with millions of subscribers have expressed their concerns over these policies. "What really bugs me about this," says DeFranco, "is either this was a purposeful move that they did not give creators the head’s up on, because I’ve seen a ton of people complaining on it, or they’re just asleep at the wheel." This comes a day after YouTube influencer PewDiePie, currently the most followed star on YouTube with got unverified on Twitter because he joked about joining Isis. In a video that got more than 3.4 million views, PewDiePie comments on Twitter’s severity.